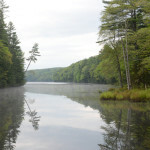 The morning mist lingers over the deep waters of Glen Lake. Here on the north end we could hear the loons just out of sight. Jackson set up to shoot a new video (below) while I painted. We savored two hours in the throes of nature…until it starting pouring. Wet but determined we soldiered on… to savor bacon and eggs at the Birdseye Diner. New Mount Saint Joseph Academy print! 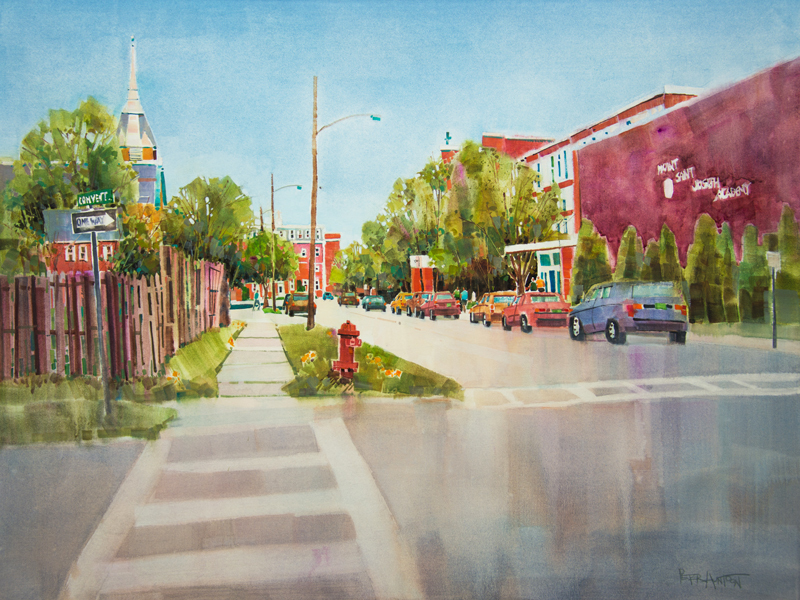 A few weeks ago I posted a painting of Rutland School…so of course MSJ was a must. While this larger original painting is already spoken for, limited edition prints are now available. Nice picture of Glen Lake. I can just imagine how serene it was, until it started to rai on you! You are accurate in your description David, thanks! Peter, this was AMAZING….still yet, and once again! 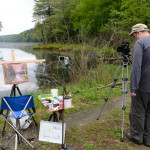 To watch you “think and feel through” a plan for your painting – on the SPOT, no less – is like watching a mystery unfold. To those of us who aren’t artists, you make it look SO EASY….but AU CONTRAIRE!!!! 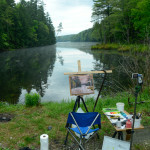 This is a “wisdom-oriented” relationship with artists’ tools and nature itself. BEAUTIFULLY done! Thanks for the AMAZING comment Victoria. I agree that painting is a dance with nature. Sometimes we lead, sometimes we follow. It’s easy to stumble when you first learn, but later on with considerable practice the moves become a bit more graceful. really enjoyed watching your “process.” Thanks, again! Terrific as always! Enjoyed the video very much. 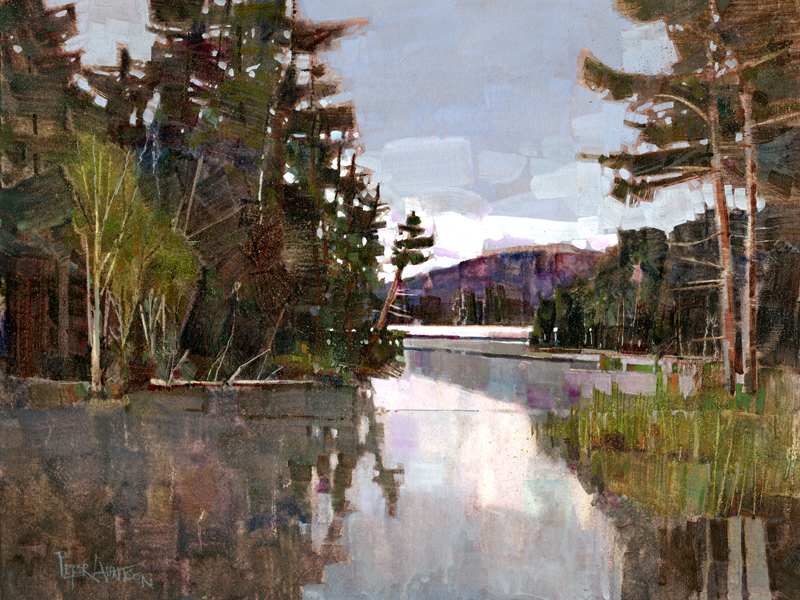 Technique question….I know you are painting with both watercolor and gouache. But, are they on the same palette? Do you mix them and if so, doesn’t that compromise the transparency of the WC washes? 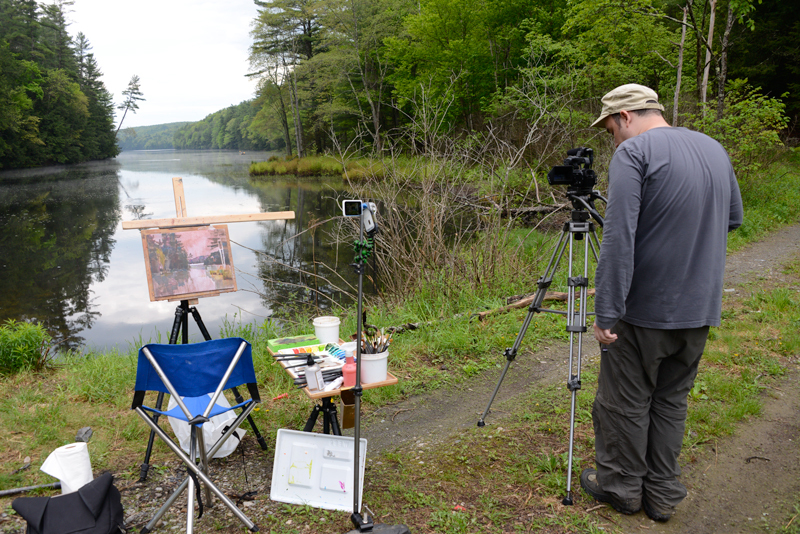 Thank you for letting us peak into your painting session! Thanks Karen, and you ask a good question. Yes, all the paint on my palette is standard transparent WC, with the one addition of titanium white gouache. I do mix them, and it certainly does affect the transparency. The key is to be judicious, selective, and sensitive to where you use it, and deft in your application of it. There is a scale of at least one to ten in small degrees, but think about just three obvious steps…transparent, translucent, and opaque. Translate the things you see in nature into one of these opacity levels and you are on your way. 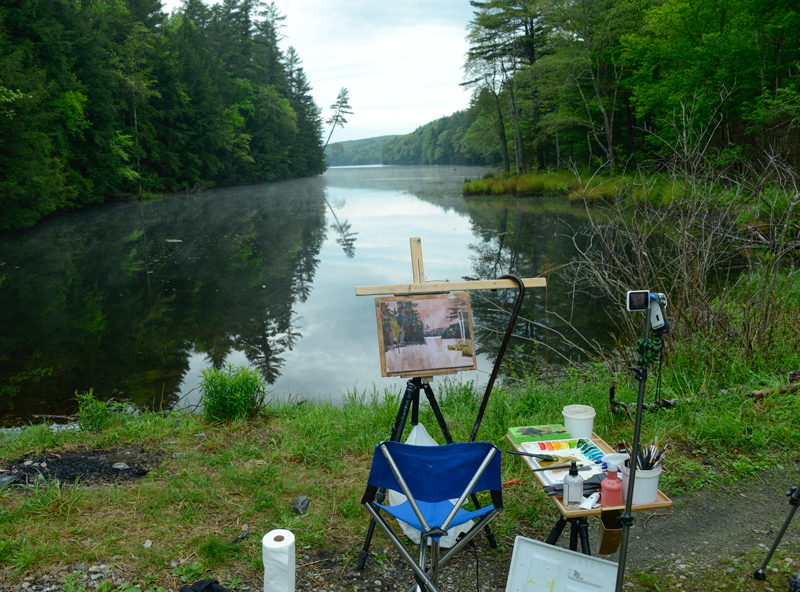 A blank canvas becomes an absolutely beautiful piece of Vermont…what an amazing process to observe. Thank you, Peter, so very much for sharing it! Sharing the artistic process with nice people who enjoy it…I’ve got the best job in the world. Thank you Krey! wow wow wow Peter!!! Into acrylics, right? Thanks Judith, no acrylic here, just opaque white gouache as described above. You could use acyclic (and oil) in the same manner. Beautiful! I love going to Glen Lake to walk my dog or kyacking. You’ve captured the beauty perfectly. Thank you very much Jean, I have to thank my friend Jackson for bringing me to this excellent spot! Where is Glen Lake? We live in Weston, I assume it is north of here! Would like to go see it! Hi Julie, Glen Lake is just above the bigger Lake Bomoseen, in Castleton. Not too far at all from Weston! Sorry for any confusion Julie. Yes, currently (5:30 AM Sat) you have the top bid. Any registered bidder can click the bid button at any time to see who has the winning bid. Right now it’s you. If someone does outbid you, you will receive an automated courtesy email letting you know so you can bid again if you choose, and if there is time left in the auction which ends promptly at 10:00 AM Monday. Please don’t hesitate to call me with any questions. 802-235-2328. Thanks so much for bidding and have a great weekend! P.
This is MY BACKYARD! We are the closest house to where you were painting! Glen Lake is almost entirely surrounded by state park land so there are nearly no houses on the lake! Your painting is quite gorgeous and the video nicely done. Since I missed bidding I will consider a print some time. Hi Karen, I did not know that…you sure do live in a beautiful place! Just let me know if you would like a print. Thanks! Peter ~ Just last week, we were at Glen Lake in the first time in many years. Back in the 1970s we were Ranger Naturalists at Bomoseen State Park and lived in the Barlow House for two summers. We had an Old Town canoe and often launched it right up the bank behind the house onto the lake. 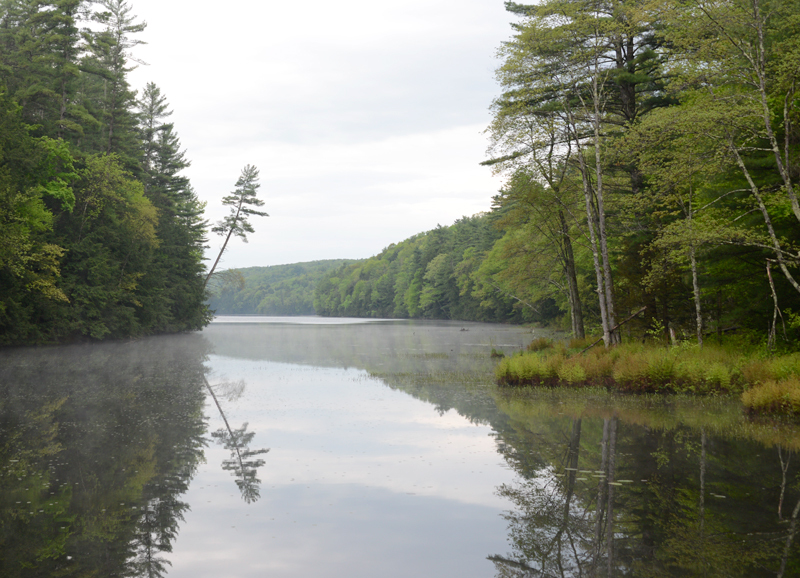 We returned to Vermont last week to visit friends, buy a guideboat and put it on Glen Lake. We stopped by Sissy’s and I found your rack card, THEN our friends of clued me into your work!! Now I can be amazed every week. I try to document Virginia in a similar way in my botanicals and journals. Thanks SO much for sharing all your work and techniques. Absolutely wonderful! It’s a small world Betty, and very glad to hear we are now connected. Thanks very much!